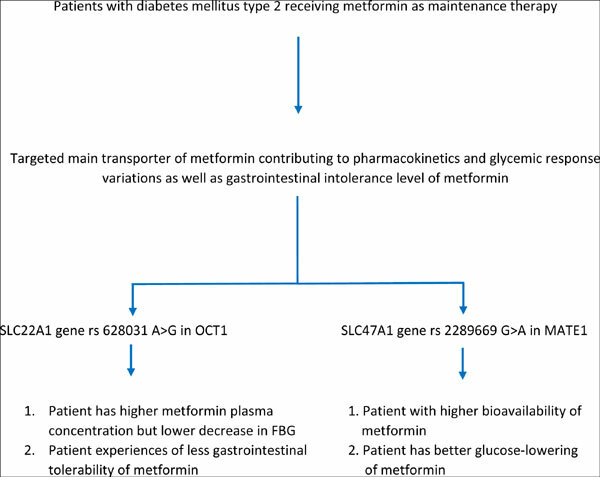 Background: Single Nucleotide Polymorphisms (SNPs) in metformin transporter genes play an important role as the cause of inter-individual variability in metformin response. The SLC22A1 as an Organic Cation Transporter (OCT)1 coding gene is responsible for the metformin influx to hepatocytes, while the efflux to bile and excretion through the kidney are mainly facilitated by Multidrug and Toxin Extrusion (MATE)1 transporter coded by the SLC47A1. Objective: This study aimed to determine the distribution of allele frequencies in rs628031 A>G (M408V) OCT1 and rs2289669 G>A MATE1 among the Javanese population as the largest ethnic group in Indonesia with type-2 diabetes mellitus (T2DM). Method: The study involved 86 adult patients with T2DM. The genotyping to analyze the target SNPs used the PCR-RFLP method. Results: The frequencies of G allele of rs628031 in SLC22A1 and A allele of rs2289669 in SLC47A1 were 60.47% and 61.05% respectively. There was no significant correlation of the allele frequencies of both SLC22A1 rs628031 and SLC22A1 rs628031 between female and male patients (P>0.05). Conclusion: The allele frequency of SLC22A1 gene rs628031 in Javanese-Indonesian population was almost the same as those found in Afro-American population as well as in other Asian populations. Similar results were obtained when the A allele frequency of SLC47A1 rs2289669 was compared to those in Chinese population. Further studies are recommended to examine the correlation between these polymorphisms and the variability of pharmacokinetic profiles as well as glycemic response to metformin and its adverse reactions. SLC22A1, rs628031, SLC47A1, rs2289669, metformin, Javanese-Indonesian population.